The Transport Workers Union has lambasted the Australian Trucking Association over its safe rates proposal, reigniting a dispute between the two groups over how best to improve road safety. In a column to be published next month in ATN’s sister publication Owner//Driver, TWU National Secretary Tony Sheldon derides the ATA for asking the Federal Government to evaluate the costs of existing safety measures before reforming remuneration. The Federal Government is committed to overhauling pay methods, but ATA CEO Stuart St Clair says there is no research comparing the benefits of doing so against programs such as highway upgrades and speed cameras. Despite originally opposing safe rates the ATA – of which the TWU is a member of – decided in 2009 to take no position on the matter. However, it subsequently changed its mind and submitted a response to the Government’s Safe Rates: Safe Roads discussion paper released late last year. "The guy has now had more positions on safe rates than Tony Abbott has had on climate change," Sheldon writes. While writing that governments have invested a lot of funds in infrastructure over the years, Sheldon says the number of heavy vehicle related deaths continue to rise. He adds that the only way to stem the bloodshed is to ensure owner-drivers are paid enough to cover maintenance and living costs. Owner-driver Frank Black, who was recently elected to the ATA to represent owner-drivers, has also weighed into the issue. "The ATA said it would not get involved in industrial relations matters, but now they are all over the place," Black is quoted in the column. "I stood on a platform of safe rates because the industry needs it and to think the ATA is going to oppose it again is a slap in the face for all drivers in the industry." Sheldon has backed the comments, writing: "He is rightly annoyed that the ATA has again gone against drivers." In the ATA’s safe rates submission, St Clair says that every dollar spent on building divided roads generates about $5 in safety benefits. "Every dollar spent on sealing rural shoulders generates up to $40 in safety benefits. Speed cameras have a benefit cost ratio of 12 to one," he says. "To get the best value for the community’s safety dollars, the Government will need to evaluate the safe rates models against these proven ways of improving safety." St Clair also wants a guarantee that chain of responsibility laws will be strenuously applied. He says fatigue management and speed legislation already allow enforcement officers to punish companies that impose unsafe contracts or working arrangements. Upon releasing its submission, the ATA noted the TWU did not support it. However, it is the first time Sheldon has commented on the association’s recommendations. 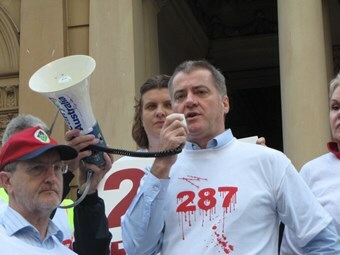 The TWU threatened to quit the ATA in 2009 after Sheldon labelled it "divisive" and unresponsive to its members concerns. He accused the ATA of ignoring the link between low rates of pay and safety and criticised its decision to vote down a proposal for a dedicated safety officer. Frictions remerged in August 2009 after the ATA supported depression tests for truck drivers. Sheldon labelled the proposal "a disgrace", claiming drivers would intentionally provide wrongful answers out of a fear of losing their livelihoods. He also argued the proposal addressed the symptoms rather than the cause of depression. "The ATA has once again ignored the reasons why drivers might become depressed – including client pressures, unpaid waiting times, long hours and unsafe payments – and instead put the problem squarely back on to the driver," Sheldon said at the time. The Safe Rates: Safe Roads paper released last November outlines recommendations to reform pay methods, including extending employee conditions to sub-contractors. The paper recommends expanding Fair Work Australia’s powers to govern a safe rates scheme. Industry group NatRoad says unpaid waiting times is the most pressing issue facing trucking operators. It says some drivers are forced to wait up to 10 hours to load or unload vehicles.